Set on 160 acres of working ranchland along the banks of the Colorado River, the Sorrel River Ranch Resort and Spa is an upscale resort that offers a relaxing mountain retreat. The family-friendly resort features deluxe accommodations in the form of log cabins and rustic-chic guest suites with wooden floors, handcrafted pine beds, working fireplaces, en-suite bathrooms with whirlpool tubs, and kitchenettes with modern amenities. A casual farm-to-table grill serves delicious cuisine prepared from ingredients sourced from the resort’s vegetable garden, and an elegant café and cocktail bar with beautiful mountain and river views. Other upscale amenities include an outdoor swimming pool and hot tub, an exclusive spa, and wellness center that offers pampering massages and body treatments, a fully equipped gym, tennis courts, an equestrian center and petting zoo. There are several hiking trails around the property that guests can enjoy, as well as basketball, lawn games, live music and entertainment, and nightly bonfires. 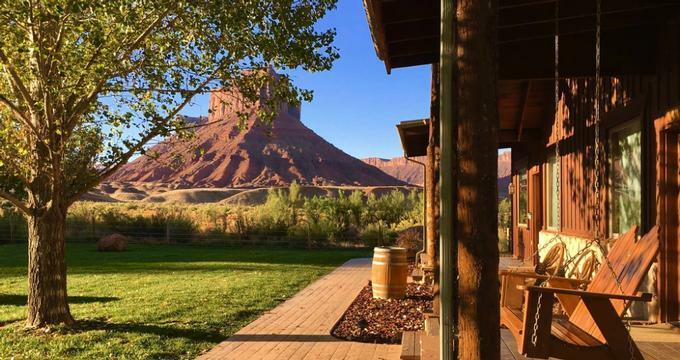 Located within driving distance from the Arches National Park Visitor Center, Canyonlands National Park, and the town of Moab, the Sorrel River Ranch Resort and Spa is ideally located for exploring the area. The Sorrel River Ranch Resort and Spa feature a variety of log-cabin style, rustic-chic guest suites with wooden floors, handcrafted pine beds, working fireplaces, and en-suite bathrooms with whirlpool tubs, and kitchenettes with modern amenities. Mesa Studios are 400 square feet in size and feature handcrafted furnishings, one king or two queen-size beds dressed in high-quality linens, down comforters, and plush pillows, and en-suite bathrooms with walk-in showers, soaking tubs, thick towels, signature terry bathrobes and slippers, and C.O. Bigelow bath products. Sitting areas have plush armchairs and sofas; dining areas have table and chairs for entertaining and kitchenettes with microwaves, mini-fridges stocked with bottled water, and coffee makers. Private porches have swings, and breathtaking views of the surrounding mountains and modern amenities include flat-screen televisions with cable channels, Bluetooth alarm clocks and charging stations, hairdryers, irons and ironing boards, and complimentary wireless Internet. River Studios are 560 square feet in size and have handcrafted furnishings, one king or two queen-size beds dressed in high-quality linens, down comforters, and plush pillows, and en-suite bathrooms with walk-in showers, claw-foot jetted tubs, thick towels, signature terry bathrobes and slippers, and C.O. Bigelow bath products. Sitting areas have plush armchairs and sofas, working fireplaces; dining areas have table and chairs for entertaining and kitchenettes with microwaves, mini-fridges stocked with bottled water, and coffee makers. Private decks boast breathtaking views of the surrounding mountains and modern amenities include flat-screen televisions with cable channels, Bluetooth alarm clocks and charging stations, hairdryers, irons and ironing boards, and complimentary wireless Internet. The spacious one-bedroom Mesa Suites offer 740 square feet of space and feature bedrooms with king-size beds dressed in high-quality linens, down comforters, and plush pillows, and en-suite bathrooms with walk-in showers, claw-foot jetted tubs, thick towels, signature terry bathrobes and slippers, and C.O. Bigelow bath products. Separate living areas have custom rustic furnishings and kitchenettes with microwaves, mini-fridges stocked with bottled water, and coffee makers. Modern amenities include flat-screen televisions with cable channels, Bluetooth alarm clocks and charging stations, hairdryers, irons and ironing boards, and complimentary wireless Internet. Private porches have swings and breathtaking views of the surrounding mountains. The two-story Family Suite is 1,000 square feet in size and features separate sleeping areas one king or two queen-size beds dressed in high-quality linens, down comforters, and plush pillows, and en-suite bathrooms with walk-in showers soaking tubs, thick towels, signature terry bathrobes and slippers, and C.O. Bigelow bath products. Separate living areas have custom rustic furnishings and kitchenettes with microwaves, mini-fridges stocked with bottled water, and coffee makers. Modern amenities include flat-screen televisions with cable channels, Bluetooth alarm clocks and charging stations, hairdryers, irons and ironing boards, and complimentary wireless Internet. Private porches have swings and breathtaking views of the surrounding mountains. A casual farm-to-table grill-style restaurant known as the River Table serves delicious cuisine prepared from ingredients sourced from the resort’s vegetable garden, and an elegant café and cocktail bar – the Epic Bar offers a stunning spot for sundowners against the beautiful mountain and river views. A complimentary breakfast is served every morning and includes freshly baked bread and pastries, seasonal fruit, cereals and yogurt, a variety of signature dishes, and freshly brewed coffee, tea, and juices. Deluxe amenities at the Sorrel River Ranch Resort and Spa include a seasonal outdoor swimming pool, sun deck and hot tub, a 24-hour fitness center, and exclusive spa and wellness center - the Sorrel River Spa. A casual farm-to-table grill serves delicious cuisine prepared from ingredients sourced from the resort’s vegetable garden and offers in-room dining, and an elegant café and cocktail bar with beautiful mountain and river views. The resort has a homestead garden from which fresh vegetable and herbs are sourced for the River Table Restaurant, outdoor firepits where guests can relax under the stars, and an adventure center with an array of concierge services, activities, and recreational adventures. Other amenities include a gift shop, iMac desktops in the lobby of the hotel for guests to use, a laundry service, access to Tesla charging stations for electric cars, luggage assistance, and on-site parking. Activities at the resort include swimming, gym, horseback riding lessons and outrides, lawn games, tennis, basketball, hiking, and interacting with animals at the petting zoo.